According to Nature World News, research has revealed that the number of bees in the world has dropped more than 40 percent during the year spanning April 2014 to April 2015. What is even more concerning than this is Maurice Maeterlinck's, author of The Life of the Bee, prediction, "If the bee disappeared off the face of the earth, man would only have four years left to live." J.Crew's Save the Bees campaign, part of the company's Garments for Good program, is attempting to address this problem by teaming up with two organizations: The Xerces Society and Buglife. The partner charities of the campaign receive 50% of the retail price of each Save the Bees collection piece that is sold. In the United States, the brand teamed up with illustrator Donald Robertson to design apparel, stationary and a candle to raise money for the Xerces Society. Emma Smith is the artist behind these bee-friendly designs. “The Save the Bees initiative is something everyone can be involved in. You can make small steps just by planting seeds or having window boxes,” says Smith on the J.Crew website. J.Crew has done just that. 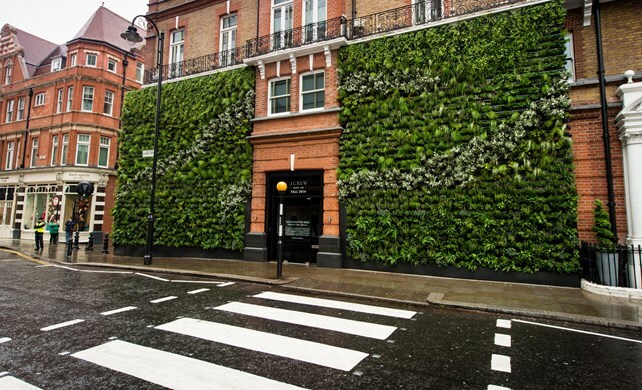 The façade of their new Sloane Square store in London, England features a vertical garden created by Treebox, an “urban greening” company, to encourage bee pollination. In addition to the Save the Bees campaign, J.Crew has also worked with the David Sheldrick Wildlife Trust to protect endangered elephants; Donorschoose.org for teachers to raise money for classroom projects; Teach For America to train college graduates to work in under-resourced communities; Edun to support the St. Ann’s Orphanage in Gilgil, Africa; and their latest endeavor with the American Red Cross, Help Nepal, to assist those in need after the earthquakes that devastated the area in April and May. To support Save the Bees or any of the other Garments for Good campaigns, visit the J.Crew website.